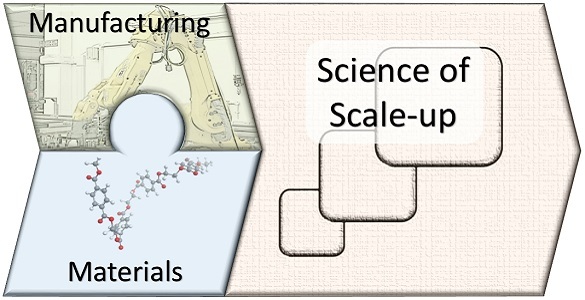 The science of scale-up is the discipline of identifying and understanding the interdependencies between the advanced functionality of emerging materials/devices and their associated manufacturing technologies. The goal of this research is to minimise risk and create flexible industrial scalability that links behaviours in the lab with the pilot scale and the pilot scale to full scale production. Traditionally, emerging materials/device technology researchers want to work with established stable production/process tools where precision/control is well understood. This is needed to develop a robust understanding of the underpinning science. Emerging production/process technology researchers equally want to work with established materials/components whose properties/behaviour are well understood to understand the effect of process on the material/device function. This naturally creates a challenging route to scale-up, when researchers need to follow closely one of the axis in Figure 1a, returning to the underpinning science when barriers are met. 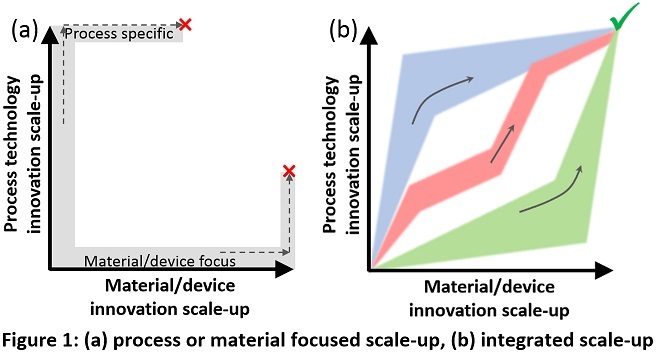 For some important emerging technology research domains, both efforts (underpinning materials/device science and production technology research) need to be progressed in parallel, as illustrated in Figure 1b. Progress in one of the parallel efforts may develop insights that could/should significantly shape the research direction of another.